Menudo is a traditional Philippine dish. It his usually made with pork. We were happy to adapt the recipe using tempeh and really enjoyed the dinner. 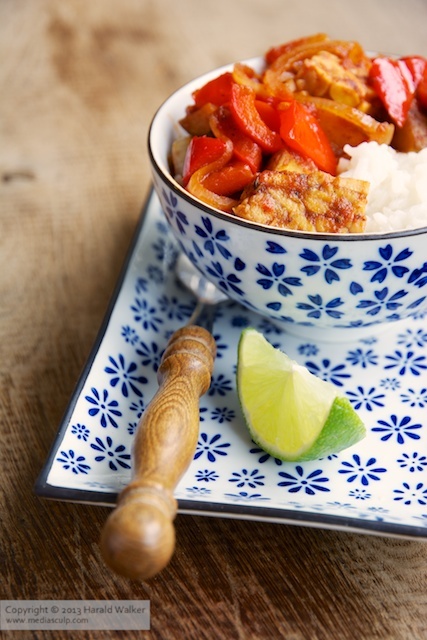 It is a mild kind of stew and very nice with rice and a bit of lime juice. Make the marinade by mixing the soy sauce, olive oil, black pepper, sweet paprika powder, garlic and lime juice. This meal is traditionally served with white rice. It is wise to prepare the white rice at this time. Cut the tempeh in bite sized pieces and place in a shallow bowl. Add the marinade and stir gently to mix. Allow the tempeh to marinate while you prepare the vegetables. Clean the potatoes. If they are organic, leave the skins on, if not peel. Cut the potatoes into bite sized pieces. Slice the onions and separate into rings. De-seed the bell peppers and slice into triangles. Heat the oil in a large frying pan. Add the potatoes and saute until the begin to soften and get a light crunchy outer edge. When the potatoes have gotten soft, add the red bell pepper pieces, mix and sauté. When the bell pepper pieces have softened, add the onions. When the onions have become glassy, add the marinated tempeh. Stir in the tomato paste and add a bit of water if needed. Add the raisins and gently mix all the ingredients as they are cooking. Serve the tempeh menudo with white rice and a lime wedge as garnish and to squeeze onto the meal. Posted by Chris Walker on October 15, 2013 in Bell Pepper, Meals, Stew, Tempeh.